Long-running Canadian TV series now in syndication. Ah, if only there were a way to view this series from beginning to end, uninterrupted. To my knowledge there is no online source currently selling this series in either DVD or VHS format. If you want to watch it, you're going to have to hunt it down on TV and try to keep track of it on your own, with little, if any, help from the TV station on which it's shown. I'm sure the program would have legions of fans if only they could find the program on the same time and channel from week to week. For the most part, it is worth the effort to try to find it. There is a good ensemble cast and even if there are a few members of the team that don't hold your interest, usually the storylines are spread out enough throughout the cast that you won't lose interest if a cast member you don't like is featured now and then. When I first began watching the series I didn't realize that Sgt. Ali McCormick (Julie Stewart) was the star. I thought she was one of the secondary characters because she wasn't the focus of the episodes I saw. 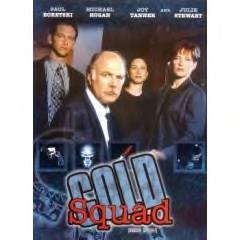 At any rate, if you get the chance, try Cold Squad.